There are several types of badge holders available from which to choose. A badge holder will provide your card with further protection from any type of damage. The badge holder can be attached to a badge reel or a lanyard for your convenience. If you are attending an event you may want to consider one of the 3 pocket credential wallet holders. These holders have adjustable neck cords so they are comfortable to wear throughout the day. In addition, the wallet holders have a front pocket with a vinyl cover to keep all of your credentials in so that they can be seen throughout the day. The middle pouch can be used to store any business cards that you pick up. The pouch in the back can be used for your credit cards and other small items. 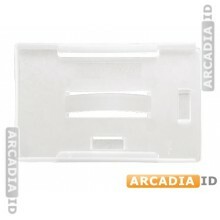 For a more simple ID badge holder option there are clear vinyl holders available. These will hold an employee ID and provide an added layer of protection for it. For employees that must carry more than one ID there are multiple card holders available as well. All badge holders will have a clear front which allows for the ID badge to be seen clearly and easily. there are different colored backgrounds available and the badge holders can be customized to meet your particular needs.